Tegra K1 Flagship. 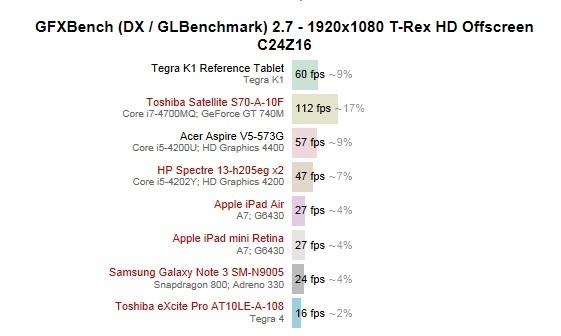 Initial benchmarks are quite promising and show a major leap over the last generation Tegra. course) to beat the Tegra K1 was used for reference purposes. measly 16fps so you can see for yourself how great a difference this is. equipped with an Intel HD iGPU. The closest tablet tested is the iPad Air which manages a barely acceptable 27 fps (still not gaming standard) on the demanding 1080p res. From these initial tests it seems that the Tegra K1 will actually be able to deliver on a intensive gaming experience in a hand held device, not to mention in cars.